4 is the first composite number, and it is 2 squared. 4 = 1 x 4 or 2 x 2. Factors of 4: 1, 2, 4. Prime factorization: 4 = 2 x 2, which can also be written 4 = 2². Since √4 = 2, a whole number, 4 is a perfect square. 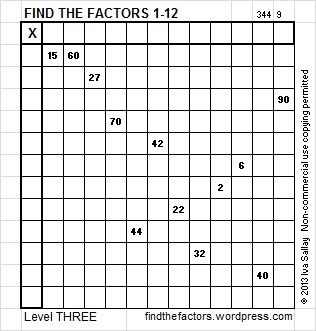 When 4 is a clue in the FIND THE FACTORS puzzles, the factors might be 1 and 4 or they might be 2 and 2. 5, 6, 7, 8……….56 is 7 times 8. 1, 2, 3, 4……….I know twelve is 3 times 4. Some children have no problem memorizing number facts, but for some children, a rhyme makes learning the facts more fun and much easier. Even though I already know all of the basic multiplication facts, I am going to memorize these rhymes simply because I personally enjoy them. I also know I will have at least one opportunity every week to share them with someone trying to memorize the facts: Already when a student asks me, “what’s 7 x 8?” I always answer in rhyme. Times One: Mirror, mirror look and see, it’s the other number, not me. A tree on skates fell on the floor / Three times eight is twenty-four. A 4 by 4 is a big machine, Iʼm going to get one when Iʼm 16. This week I even wrote one myself: Twelve times twelve / Is a dozen dozen / A gross one forty-four / Just ask my cousin. When a very young child loves a rhyme, he or she will want to hear it over and over again. Mother Goose rhymes have been enriching lives for years. Being able to fully comprehend what the rhyme is about isn’t necessary at first so even preschoolers can be introduced to these rhymes. Robin Liner writes a blog (crazygoodreaders.wordpress.com) that discusses reading and dyslexia. On October 5, 2013 , she wrote Rhythm and Rhyme: A Phonological Power Tool. She wrote, “Rhymes provide subconscious clues.” That means someone is more likely to get an answer right when that answer rhymes with the question. What a fun and powerful way to learn! Much of what she wrote not only applies to learning to read but also to learning math, science, history, ……. anything. Twice a week I put 6 new puzzles in an excel file that is attached to this blog. The puzzles can be solved using logic and knowledge of the multiplication table. Here is one of the puzzles I created this week. Click on this link, 12 Factors 2013-11-07, for more puzzles and the previous week’s solutions. How do you solve the puzzles? Place the numbers 1 – 12 in both the top row and the first column so that those numbers are the factors of the given clues. Quite often children who are dyslexic struggle with math as well as reading. If your child has trouble memorizing basic math facts check out this article as well as the accompanying Blog, “Find the Factors”. And consider telling your child that even Albert Einstein had trouble remembering basic math facts.